Sarah jumping on top of a sand dune, with Saudia Arabia in the background. There is a simple, yet distinct beauty, I have discovered, that belongs to a desert. The vast, open sky empties any signs of boundaries or hindrances because nothing obstructs one's vision. Anything seems possible because there is a limitless horizon surrounding you. 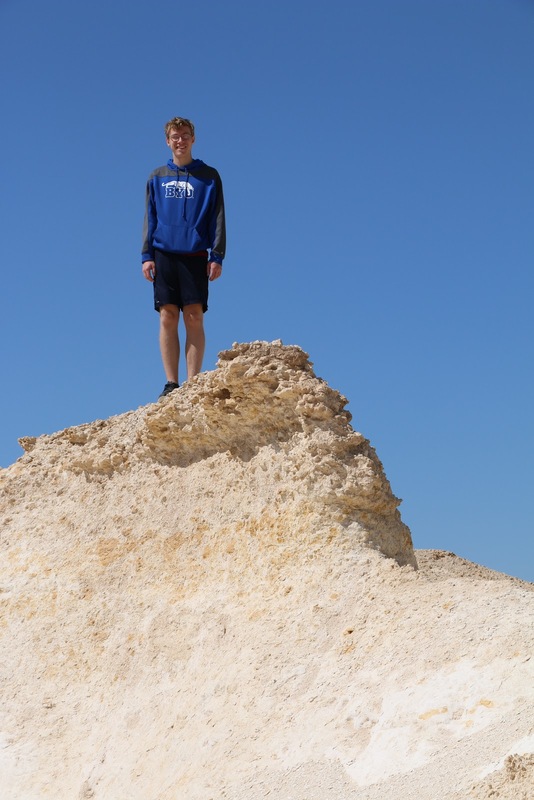 At the top of a sand dune, one can feel a sudden clarity of perspective--with the wide expanse of sand that strips away extraneous, irrelevant concerns. If there is a sunset or ocean view in the scope, all the better. To merge the everlasting horizons of sand, water, and sky together, with no other obstructions, is a view that reveals we are indeed part of a shared cosmos. Wendall Berry, a favorite poet and essayist, describes one of those moments: "And I feel above me the day-blind stars waiting with their light. For a time I rest in the grace of the world, and am free." A Middle East desert can be liberating, even alluring, but it is also full of contradictory surprises that can be hilariously unpredictable and entertaining. One can even be unexpectedly invited to tea at a remote Arabic movie set in the middle of the desert. In typical Qatar fashion, we have stumbled upon some amusing, but beautiful discoveries in our explorations. Each time we drive home, we all marvel at the captivating beauty of the desert, laughing, but sometimes reflecting, at what we have chanced upon in our travels. 1) Every bush or tree is a special revelation, a new grace all its own. 2) As long as one has a supply of replenishing water, the desert holds a stunning splendor. Unexpected beauty is on each crest or plateau of sand, if you watch for it. 3) You can be entertained by unforeseen friends in surprising places in a desert. Travelers and sojourners who were strangers minutes before can quickly be friends. Desert nomads know the desert can bring harsh conditions so provisions are freely shared and given--even to strangers. 4) There is a simplicity found in desert living, a deliberate choice to live in a more uncluttered, uncomplicated way. The desert sheds pretension. One realizes there are so many things that are unneeded and unnecessary; a traveler cannot carry everything on one's back. No snow in Qatar this year so we have sufficed to make sand a winter sport. Zach, one of our visitors, looking out to the endless sand near sunset. We called it his "Zach of Arabia"pose. Rugs are commonly spread out for picnics and barbecues. Annalise warming up after some kayaking in the mangroves. "Sand bashing," or driving in the dunes is a favorite recreational activity here. 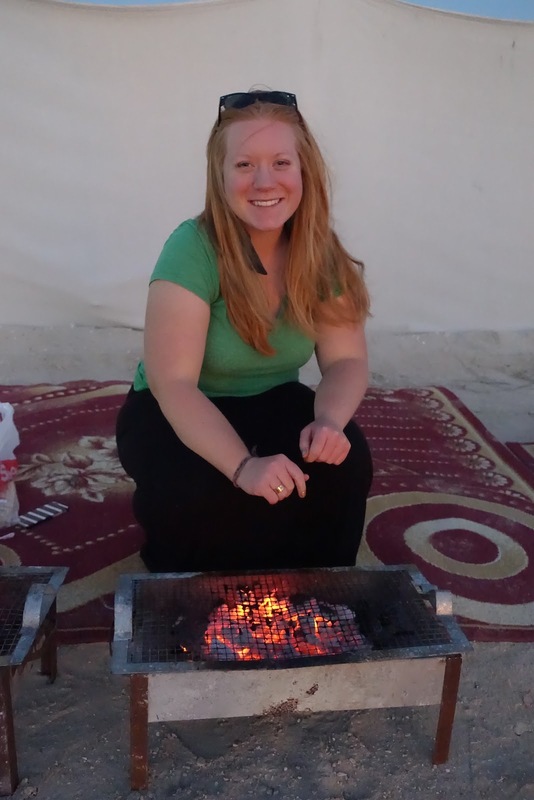 Spending New Year's Eve in some Bedouin tents with some new friends from Hungary, Italy, France, and the UK. I never tire of the camel spottings. It always reminds me I am "not in Kansas anymore." My mom about to climb on the camel.... 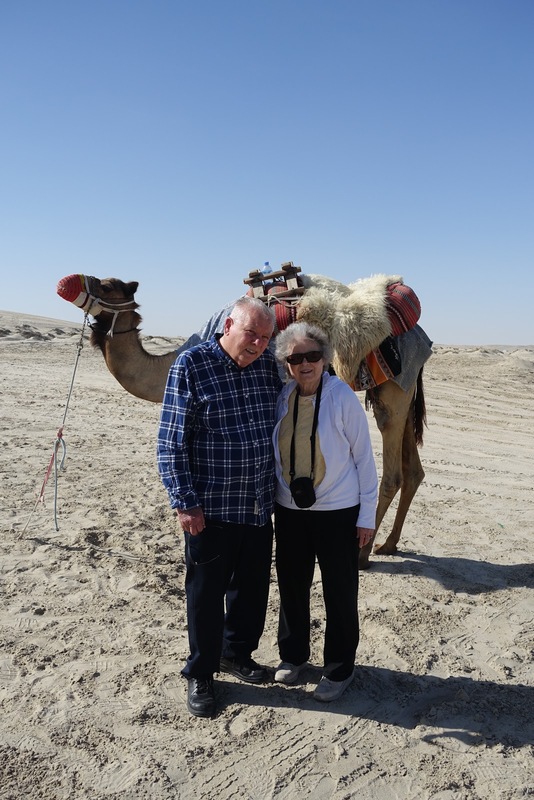 I was proud of my parents, ages 75 and 80, for being willing to let us take them on some desert adventures. My dad, never timid to talk to anyone (even if they don't speak English), meeting an Egyptian fisherman on the shore. They were great friends in about two minutes. New sculptures, by American artist, Richard Serra, who is known for his public art. He was commissioned to combine sculptures with the Qatari desert. www.qm.org.qa/en/project/east-west-west-east-richard-serra An amazing gem of art in the middle of the desert. Aman, a Sudanese guide, who has lived on the movie set premises for many years invites his sole visitors (us) for some herbed tea and conversation. First he took a sip, pronounced how good it was, and then offered my husband a sip too. No germs from strangers in the desert! There are not many people out in the middle of the desert to speak to for him, but herds of ibises wonder around the movie set every day. An ibis spotting. This desert creature is Qatar's national animal. Amazing to meet one as we drove along the bumpy, sandy road. Peter running up to the movie set. Some old villages built into the plateaus for a movie set. The Persian Gulf is always a beckoning, inviting sight. Every time I get to see the blue and turquoise hues of the Persian Gulf, my heart leaps! I like what you said about the heat feeling like a "hair dryer." Absolutely true! Yes, The desert has it's own beauty !! To see the sunrise or sunsets are amazing. I too live in the desert however I am still in Calif. The sun is bright, the sky is blue and the air is clean, what more could a person ask for !! The desert is something that grows on you, would not want to go back to city life. Enjoy every moment !! Yes, there is a freeing beauty in the desert. I am glad you can live there. I loved every picture! Will you tell us about your observations on the food there? I love hearing about your adventures Maryan!